My brother-in-law Tra sms’d me the other day just as I was planning to play golf on the weekend. ” hey mate want to play golf ?”. HA ! HOw freaky was that ? So at 6am on Friday I picked Tra up and we headed for a spot of breakfast at a very smart restaurant in Phnom Penh before heading over to Tai’s house to pick up a few extra lads. 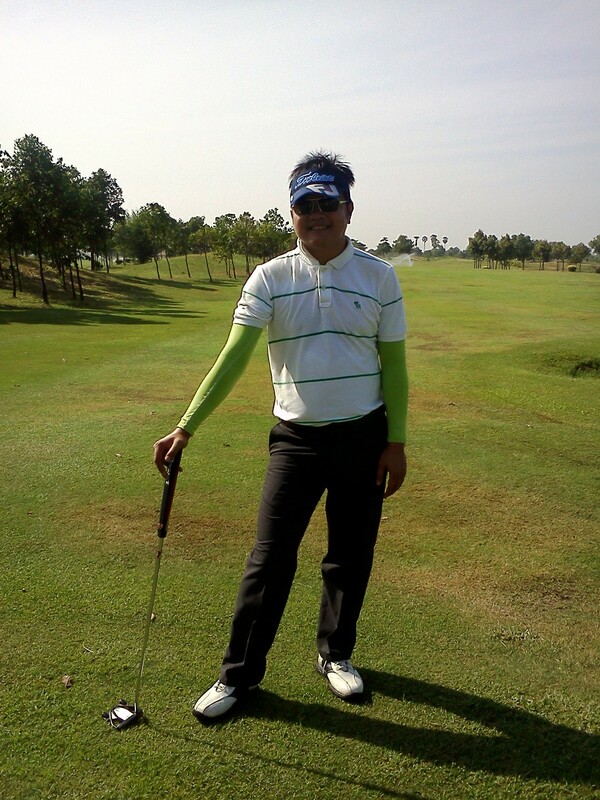 It was then out to Royal Phnom Penh Golf Course where I changed into sand shoes and the others changed into full pro gear including amusing arm stockings , procured buggies and caddies and headed for the course. 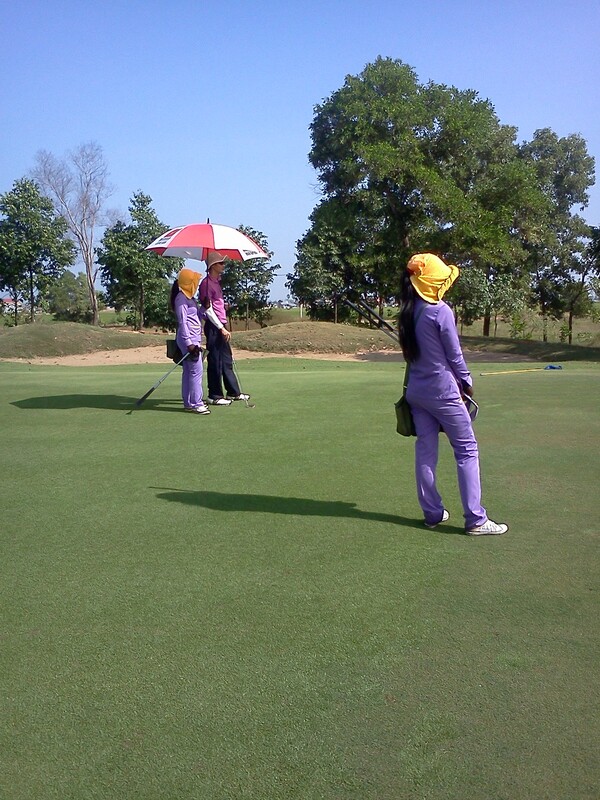 Teeing off hole one is always full of apprehension on any golf course and RPP is no different. Will I connect with the Big Bertha and hear that delicious PING that sees my ball fly long and straight and announce I am a contender or will I top it and hear a sickly DOING as it spears off left into the first water trap and announces I am a wanker ? As it turns out….last Friday…..contender !! Absolutely smashed that little white ball with a PING and thus the day started in earnest. The thermometer on my GPS is showing 34c by the time we hit 9am and so its slip slop slap all the way for me – though the bright green and pink arm stockings are presumably stopping the lads arms from burning. As per last time I played, the caddies just amaze me. They are all young girls in their teens or very early twenties and they do everything for you. They know exactly how far it is from wherever you are to the pin and are waiting with a selection of clubs . They shade you with umbrellas whilst you wait for your mates to chip,drive or putt and they have tees ready to go at each new hole. Buggy driving, beer fetching,sun-glass holding…..no worries. They are awesome and really make the day a breeze. For a bunch of guys who only started playing recently and now play 3 times a week, my Khmer mates are playing VERY well. They are certainly not mads hackers and Tai actually has a really nice swing on him and could probably get his handicap right down if he wanted. There was no fierce competition or anything like that…..just a really good vibe as we all did our best to get around the course without losing too many balls ( one in my case ). Not a problem if you do lose balls as there are guys on the course selling plastic bags of almost new balls they have retrieved from lakes etc at $10 per 50 balls. That’s 20c a ball ! The round cost $50 and that’s all inclusive of course fee and buggy and then you tip the caddie $10. 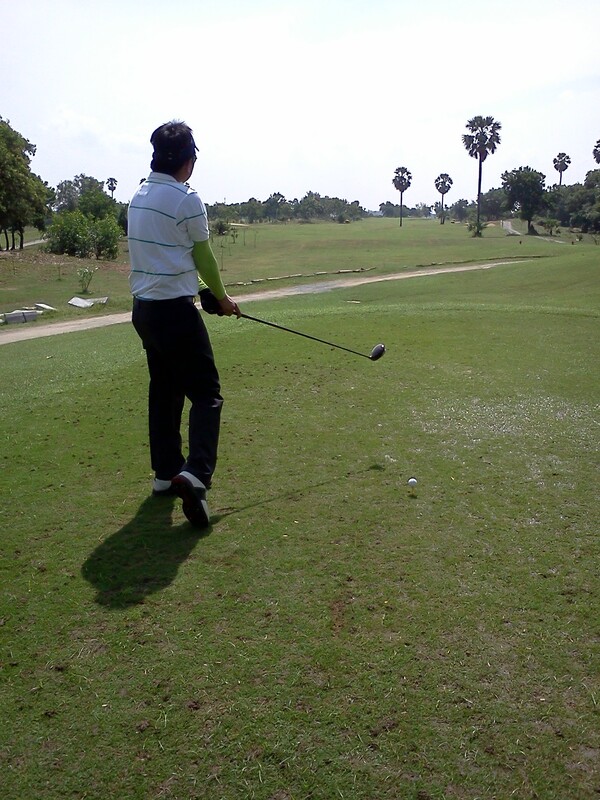 I really must get a set of clubs and get back in the swing as it were. Its a great game and very soothing on the stressed out soul. funny , the last time we played golf you got completely trolleyed and broke your leg……. ROTFLMFAO !!! Too funny Goyz. Cant believe you remembered that. Yeah what a disaster hey . I remember sitting outside on the pavement of The Royal sculling bourbon for the pain and then the ambulance officer giving me a dressing down ” why are you drinking you idiot we have to operate ! ” . Like…I was pissed already ! . I wouldn’t mind a few golf tips from the goyzmaster these days….I seem to remember you were / are a bloody fine golfer. Still playing ? well mate , still clinging onto my 2 handicap but playing far less these days as my eldest is football mad and I’m coaching his team !! The best tip I was ever given was to grip the club no harder than if you were holding a baby bird, gripping too hard restricts the power and speed from your swing and 90% of amateurs are guilty of it. Enjoy your golf pal , its the best game in the world. Mate…true story….every time I hit a crap shot or two and can feel my concentration slipping- I remember you and the above tip !! I swear to god !! That one tip alone is priceless.That…and you corrected my grip and got me to rotate my bottom hand further clockwise so we couldn’t see the pad of my thumb all the time AND keeping my head down and eyes on the ball all the way to impact. One day in the future maybe we can play again…..
but do you know what ? lets make sure we make it happen….